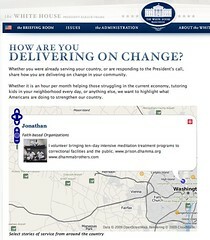 This weekend, Tim Waters (chippy) noticed that the WhiteHouse is using OpenLayers mapping library and OpenStreetMap basemap tiles in their new Delivering on Change page. Whether you were already serving your country, or are responding to the Presidentâ€™s call, share how you are delivering on change in your community.Whether it is an hour per month helping those struggling in the current economy, tutoring kids in your neighborhood every day, or anything else, we want to highlight what Americans are doing to strengthen our country. The new US administration is continually doing amazing, and open, initiatives. There is incredible excitement around Recovery.gov as a testbed for the next generation of transparency and embrace of technology and open data feeds. My thoughts on interesting applications wouldn't be complete without pointing out a couple of suggestions. While many defend the default OpenLayers controls - I personally think that implementors should take that next step and apply minor customization to better integrate the look and feel of the map controls into their site. I've talked before about how easy it is to change some CSS to replace the controls. Perhaps even just a darker blue background to match the White House blue in the logo. Customized? Another, less highlighted but very important for Government sites is the integration of accessibility controls. OpenLayers supports map navigation using keyboard inputs - which provides for alternative interfaces to navigate the map. It's not clear if this is official "508 compliant", but at least demonstrates the potential. Accessible? So do you want to help make Change, especially with mapping data and technology? Come join us at the Washington, DC mapping party - currently planned for June 20 + 21, 2009 somewhere in DC (details coming soon). Or join a mapping party near you.